was Rowan's and my first born. She was my pick puppy, but I placed her with a friend. It was not the best match and she came back to live with me at age of four (with a wonderful foundation in agility. 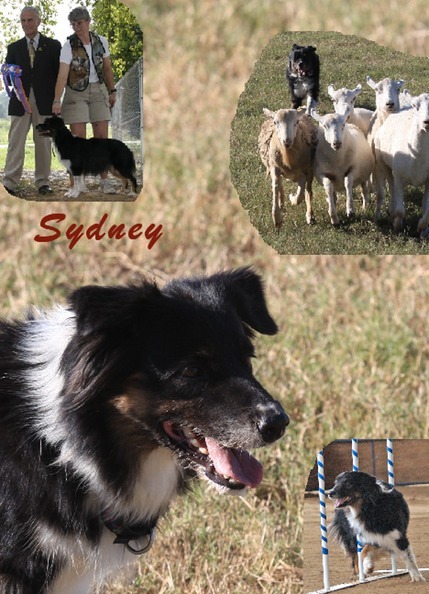 When she was 8, she finally decided that she would work stock, helping her littermate Ron with morning chores and earning her started sheep and cattle titles, as well as an open cattle leg. Syd spent her life looking for that special person. She found happiness being my young friend Ashley's buddy for a couple of years. She was diagnosed with Bladder Cancer January 2010, (already Metastatic) but lived quite happily until that September. She was quite a special dog.